In today’s ever-challenging job market, job seekers must be on the hunt for new opportunities 24/7 to maintain a competitive advantage over other top job candidates. But to do so successfully, job seekers must have constant access, both at home and on the go, to their social and professional networks, up-to-date job postings and powerful tools that can help them make quick connections with new contacts and potential career stakeholders. How? Well, today we give you one of the best solutions ever – an amazing job hunting app, called Startup Jobs. 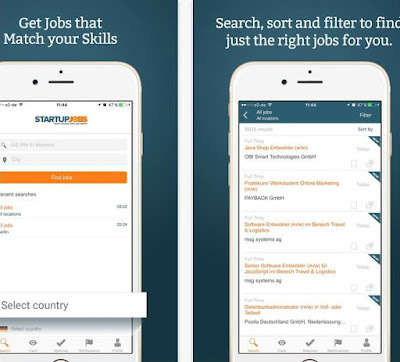 The Startup Jobs app is developed by a devoted team of members, GAM Software Solutions, who had a mission in making a platform suitable for both job seekers and job givers. The idea is to connect the worldwide innovative and cool startup companies to the top talent and the top talent out there, in pursuit of their dream job to the right startup. Also, it is simple to use – just create your personal account, enter your personal information and wait for the app to match your skills. It features more than 23 languages and it is available in more than 60 counties in the world. You can even connect with your Linkedin profile, Xing profile or apply with the Startup Jobs site. Beautifully designed, well-organized, user friendly, reliable and flexible, Startup Jobs is completely free for download. Get it today from Google Play or from the App Store and show it to your friends and family.